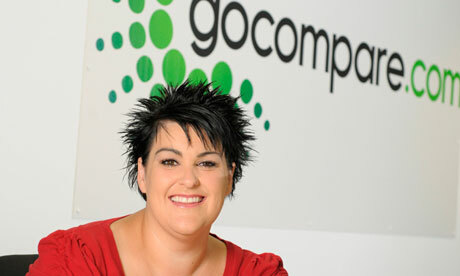 Interview: Hayley Parsons OBE, Gocompare.com | How Did They Do It? The mother of two from Wales left school with just six GCSEs but is now thought to be worth roughly £95 million according to the Sunday Times Rich List. Hayley quit her job at Confused.com in 2006 with a plan to set up her own, better, price comparison site. Like many business startups, Gocompare.com had a few challenging years before the site began to take off, but as is the case with so many entrepreneurs, she never lost faith in the usefulness of the idea. However, unlike most of the entrepreneurs in this series, Hayley’s bravery in starting her own company is all the more acute because she sacrificed a well-paid job at Confused.com to make it happen. She entered insurance straight after school and had amassed 14 years of experience climbing the corporate hierarchy at Admiral, the owners of Confused.com before she started Gocompare.com. The site received some major financial support from insurance entrepreneur Tom Duggan and a loan from Esure that helped to cover the costs of its early development. As for Gio Compario, the company’s ubiquitous Welsh opera-singing advocate, Hayley “wanted something that people literally couldn’t forget”, and she certainly achieved that. A lot of people comment on how you left school with six GCSEs, what did you make of school? I was never really somebody that loved school in the traditional sense. It’s not that I didn’t like learning new things, it was more to do with the fact that I just really wanted to stand on my own two feet. I never really liked the institution of school and just felt that I could be accomplishing more outside of that environment. The education system today is completely different to the one I experienced in my school days. Young people are growing up with technology as a second nature and the education system has gone from an archaic chalk and blackboard lecture, to an interactive experience that I feel is helping young people develop key skills. Did you know what you wanted to do when you were growing up? Yes, but it wasn’t what I’m doing today! Funnily enough, I wanted to be an interior designer when I was growing up. You never know, if things had turned out differently, today all the houses in the UK could be covered in animal print or I could’ve had my very own Changing Rooms show. Now that I’ve said that, it’s probably best that I went down the insurance route. What was the original inspiration for the Gocompare.com venture? I was part of the team at Admiral that launched Confused. At the time, price comparison sites were a completely new idea, so my role was to convince insurers that comparison sites were the future of the industry – but as you can image, that was easier said than done! I spent many happy years at Admiral and worked with some fantastically talented people. But ultimately I became dissatisfied with the direction that the comparison site industry was going. Back then, sites were solely focused on price and didn’t mention the features of the policy. This meant that customers might’ve been getting cheap quotes, but weren’t offered much information on the policy and could’ve found that they were missing out on features that they wanted. I decided that I could either stay where I was, or I could start something new and make a difference. The result was Gocompare.com. Gocompare.com was the first comparison site to display the features of insurance policies, not just the price. It is entirely consumer-focused and has always set out to demystify insurance and help people find the right policy at the right price. The needs of our customers have underpinned everything that we have done, and are still the most important influence on our company. This belief has not only helped us get where we are today, but has also made us the only price comparison website invited to be a member of the British Insurance Brokers’ Association (BIBA) thanks to our focus on transparency and customer care. So it’s 2006, you have left your job at Admiral and you are on your own with some investment money and a relatively small team behind you. How did you go about establishing yourself in the very competitive world of price comparison sites? What was the strategy in your first year? The early days were certainly a challenge. Trying to build a recognisable brand from scratch isn’t an easy feat, and I would be lying if I said that it wasn’t daunting. Gocompare.com got its initial funding from Tom Duggan, an insurance industry veteran. Having worked my entire adult life in the insurance industry, I had built up good relationships with people like Tom, so acquiring the initial start-up funding wasn’t too difficult. To begin with we sought out to grow the business organically, building up a customer base and slowly gaining a share of the market. It wasn’t until we heard of Tesco’s plans to enter the price comparison industry that we really decided to step up our game, as carrying on the way we were could have meant getting muscled out of the market.We knew if we wanted to seriously compete we needed to raise more capital. We were able to secure an additional loan from Esure to help fund the step-up. With this investment we were able to build a brand that could challenge with the previous market-leaders, and realise our goals of creating a company that would put the power back in the hands of the customer when it came to shopping around for insurance. Our competitors had to change the way they operated to catch up with us, which allowed Gocompare.com to springboard ahead. You’ve spoken about how some of your friends described you as a “fruitcake” for attempting to start your own site, how did you avoid getting perturbed, or were you perturbed, by the dangers of going it alone? What’s important to remember is that I was never ‘going it alone’. I’d convinced some of my closest (and most talented) friends to join me in starting Gocompare.com so even though I did have some people calling me crazy for leaving a very secure and well paid job, I also had some amazing people supporting me. Where did the idea for Gio Compario, your opera-singing advocate, come from? Our initial adverts were great at educating the consumer about comparison sites. But what we really wanted was an advert that people couldn’t forget, it had to be an advert that made people look at their insurance renewal letter and think ‘Gocompare’! So, we met with a brilliant husband and wife advertising team, Sian Vickers and Chris Wilkins and told them that we wanted something that people literally couldn’t forget, and that’s exactly what they gave us. You have also talked about enjoying being in a male dominated industry. Have you faced any difficulties as a woman in business and, if so, how have you overcome them? I think that some women become transfixed with the ‘glass ceiling’. I’ve always thought that if you believe there is a glass ceiling, you’ll spend your life on the floor looking up at it. Anybody can be successful in any industry as long as they work hard and are nosey and noisy enough. To succeed in business you need to be brave enough to ask the right questions and talk to the right people, it’s the only way you can learn to be better at what you do. If you spend your time thinking about what’s holding you back, then you’ll never move forward – it’s wasted energy. In my experience, gender has nothing to do with how talented somebody is at their job. At Gocompare.com we have a mix of both male and female staff and management. Everybody is there because of how hard they work and how good they are at their job; gender isn’t even a consideration. What would be your advice to anyone interested in starting their own online business? If you’re thinking of starting your own online business the most important thing you can do is research the market. The internet is a fantastic tool for identifying a target market and checking out the competition. Look for a group of people who are just screaming out for something new or better than what’s currently out there and then look at how you can provide that. Can you satisfy the demand? Can you get a team of people together who can take on the job? If you need funding, can you raise it? If you can, then start to look at the practicalities of starting your business. Before you commit to anything, it’s really important to look at what your worst case scenario would be. If, for whatever reason, your business doesn’t work out the way you thought it might, what would be the consequences for you? For instance, If you’re leaving a secure job there’s a good chance that you’ve got a strong enough background and CV to get another job, so it’s not too risky. Once you’ve made the decision to do it, go for it and don’t look back. Pingback: Founder of Gocompare discusses starting a new online business | How Did They Do It?